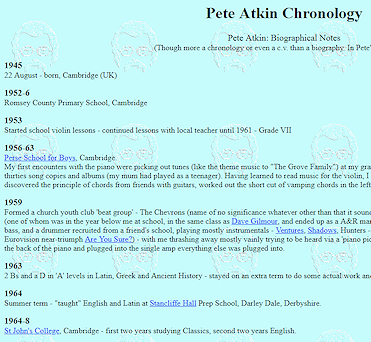 For 22 years Smash Flops has stood right here as the go-to Internet location for news and information on Pete Atkin and his music. In that time I've tried to maintain the Website as a rich but easy-to-access resource. In the early days this meant avoiding many of the dynamic features which many designers latched onto to make sites eyecatching and 'trendy', so that I didn't exclude visitors who might be using computers or Web browsers without the latest functionality, or indeed might not have a high bandwidth connection -- in the 1990s most of our users were on dial-up connections, some at data rates as low as 64kbit/s. So my Web pages were all coded as straight HTML (someone described the layout as 'old-fashioned' -- a compliment indeed! ), and the MV emails as plain ASCII text. Similarly, my concessions to mobile users go only so far as to present each page in a manner that looks as close as possible to what you'd see on a PC -- I don't compose a separate 'mobile' version of the site. This means you may need to zoom in on some pages to read the content, but at least it's all where it should be. Of more interest is the content enhancement afforded us, not only by the developing standards and improved client software, but also by the near-universal availability of high-speed broadband Internet access. This is most apparent in the Discography, which began with just the lyrics of each song, then expanded to include chord symbols, annotations and even comic parody lyrics. Most recently, thanks to Pete's generosity, I've been able to add a pair of music players, which allow visitors to listen to almost every song Pete has ever recorded. 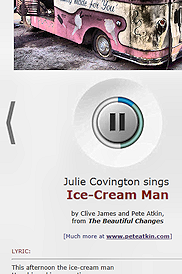 Each album or collection represented has a brown 'Playlist' in the page's right-hand column, and selecting any title there causes the song's audio to be streamed to the player using the HTML5 delivery method. 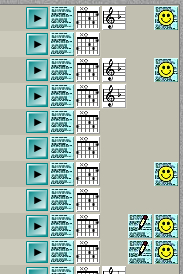 Some songs are present in more than one version, with a different image to accompany the playout. 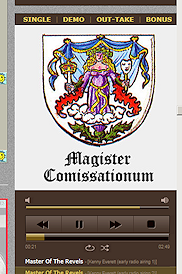 Additionally, most song listings in the Discography now sport a 'play' button alongside the other options, which opens a new audio player window containing a relevant (or otherwise) image, plus the song's lyric. 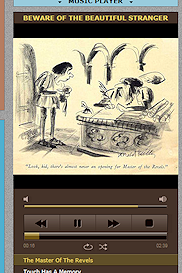 This alternative player is optimised for mobile devices, but should work on any platform. Another new button is the clef. 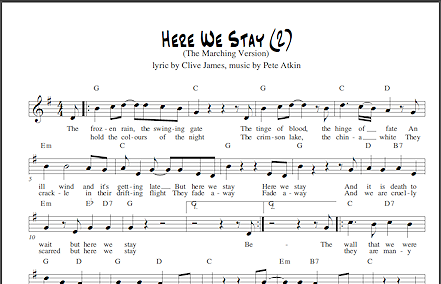 This opens (with the option to download) Pete's 'lead sheet' -- melody line, lyric and chordage -- of the song in question. Some browser plug-in PDF viewers don't always render the music notation fonts correctly -- if you're seeing some odd characters in there (apart from any that Clive put into the lyric! ), try downloading the PDF file and opening it in Acrobat Reader. 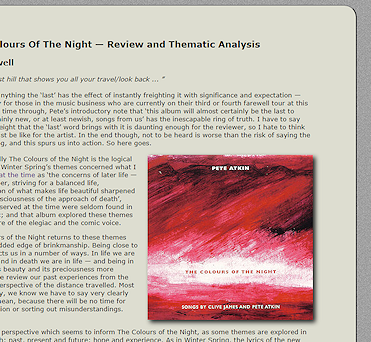 I've also added some enhancements to the Midnight Voices layout. By now, most of you will be using the 'Short' version, which prioritises the 'Recent Posts' lists without cluttering up the interface with the traditional Boards/Threads tabulation of a Web Forum. Hovering the mouse over each post's title now pops up the first few lines of the message content. Also, the 'Users Online' feature (lower left) now shows further detail when the mouse is hovered over the 'Guests' and 'Members' listings. One other small change: the 'Instant Message' feature remains, but I've renamed it 'Personal Message' in line with social media terminology, and to avoid the inference someone once made that a message sent via this system will reach the addressee immediately: this will of course only happen if the addressee has selected e-mail notification for PMs; otherwise he (or she) will be alerted to the presence of a message only when next logging in to the Forum.